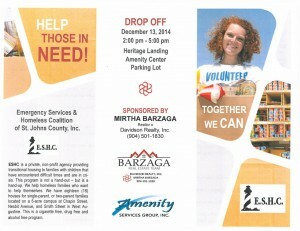 Davidson Realty agent Mirtha Barzaga will be sponsoring a food and supplies drive this Saturday, December 13 between 2 p.m. and 5 p.m. at the Heritage Landing Amenity Center. All are invited to donate to the drive, which will benefit the Emergency Services & Homeless Coalition of St. Johns County. The drive is co-sponsored by Amenity Services Group, Inc. The Coalition, which provides transitional housing to families and children who have experienced significant challenges, is in need of the following: baby items, building supplies, cleaning products, household items (e.g. light bulbs, garbage bags, batteries), home furnishings, paper products and kitchen and non-perishable food items. Visit http://homelesscoalitionstjohns.com/ to view the organization’s full wish list. For more information about donating, contact Mirtha Barzaga at (904) 501-1830 or mbarzaga@davidsonrealtyinc.com.